You'll be uber delighted with our Beautiful Cherry Hypericum Flowers. They have been harvested healthily and will arrive freshly cut at the place of your choice. Cherry Hypericum Flowers are uplifting and bright pieces of floral perfection. These buds bloom and produce a wonderful scent and boast the plushest petals you ever could see. Beautiful Cherry Hypericum Flowers can be given to celebrate your anniversary, engagement, graduations, coming of age, retirements, baby showers, baby births. Their bright cherry color make them ideal to give someone or decorate with in any season, but especially Spring and Summer. We are passionate about every flower that we grow. Our passion gives us the attentiveness and dedication necessary to ensure the freshness of every petal we produce. 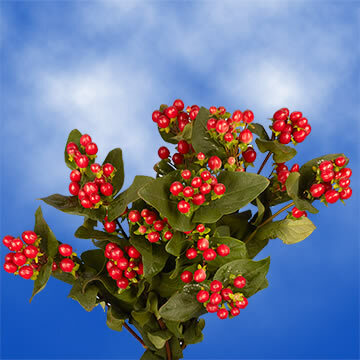 Order our Beautiful Cherry Hypericum Flowers and you'll be glad you did!